Deer Valley's Carey Mclean will attend SAIT in Calgary. Deer Valley’s Carey Mclean will continue her golf career at the collegiate level. 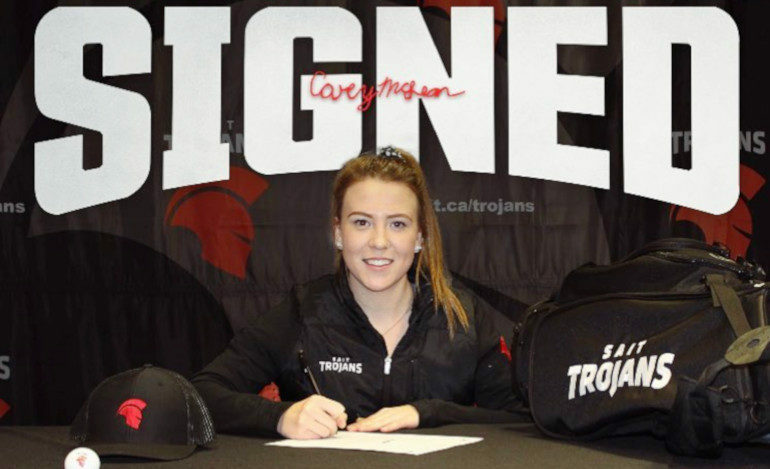 Mclean, 17, has committed to play college golf for the SAIT Trojans of the Alberta Colleges Athletic Conference (ACAC) beginning next year. Mclean said she approached the Calgary based school while trying to plan her post-secondary education and SAIT checked all the boxes. The SAIT golf program returned to the ACAC in the fall of last year for the first time in two decades. The players, both ladies and men, compete in two regional events around Alberta. The conference also has a championship that leads to invites to the Canadian Collegiate Athletic Association National Championship. Mclean said she’s excited to have her scholarship opportunity locked up while still completing her high school. “When I started golfing I never expected to play at this level. Getting a scholarship is exciting for me because I get to further my career and play golf, which I love,” she said. Mclean competed for Team Saskatchewan at the junior women’s national championship last year and hopes to win the Saskatchewan juniors this upcoming season at Nipawin’s Evergreen Golf Course. She will also compete in the Saskatchewan Women’s Amateur Championship at Moon Lake Golf and Country Club in early July. Mclean is also a member of Saskatchewan’s High-Performance Program (HPP). She said the HPP was key in her development and post-secondary goals. “For sure, Jason (Schneider, coach) works really hard to make sure we understand how we can improve our game and ourselves. He’s helped a lot with that. He checks in every week with us and makes sure we are doing what we need to do to better ourselves and our game,” she said. Mclean plays several events across the Maple Leaf Junior Tour (MJT) as well in the summer. She said broadening her horizons and seeing more courses in another province and moving from home will be a great learning experience. “I’m excited to be able to live away from home and see the different courses there are. Playing the usual courses, you get used to it. I want to try challenging myself and playing with people at a higher level,” Mclean said. In the classroom she was hoping to take occupational therapy however there is a waiting list for that program. For her first two years she is going to study tourism and travel and potentially move into the four-year occupational department.